For other factions I had magnetized jacks and there they made more sense really. Especially for Convergence as all 6 heavies had a place somewhere and they were easy to magnetize. I even magnetized a slayer chassis for Cryx but that was to be able to switch between 2 character jacks more than to be able to play the slayer 😀 . But now MK3 has landed and jacks have a more prominent role, or at least there are more jack points which results in an increase in jacks overall. I went over de different jacks in the faction and did a little calculation on how many I would need of each. I decided I wanted the character jacks to each be their own model so that mean I would need 1 models for Discordia (previously part of the magnetized Shyeel kit). I already had one kit that could be a Manticore or a Hydra, and with the new battlebox I could make a second one of those. I’m still debating if I want to be able to make phoenix with the kits or not, I have a dedicated Phoenix model and currently playing 1 is debatable, let alone playing 2 (The Chimera is simply the better choice cost wise). 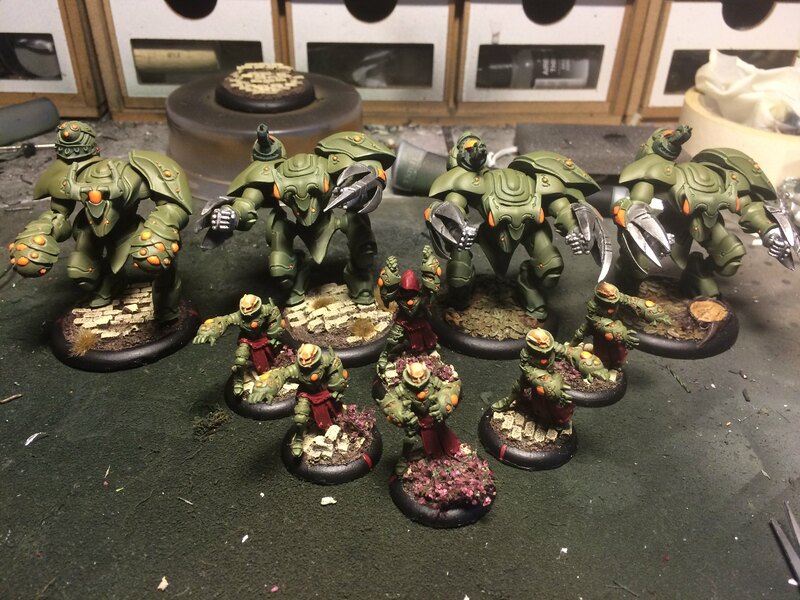 So when the Bbox arrives I will have what I need regarding shyeel heavies, a phoenix and 2 kits for either Manticore or Hydra (not seeing why more than 2 would be played at this time). That leaves the Vyre kit. I have a dedicated Hypnos model and a dedicated Banshee model, so I’m pretty fine on that end. However I owned 0 Daemons or Sphinxes. The Daemon still doesn’t seem like an option I will play any time soon, but I still want the option if I’m going to magnetize Vyre kits anyhow. 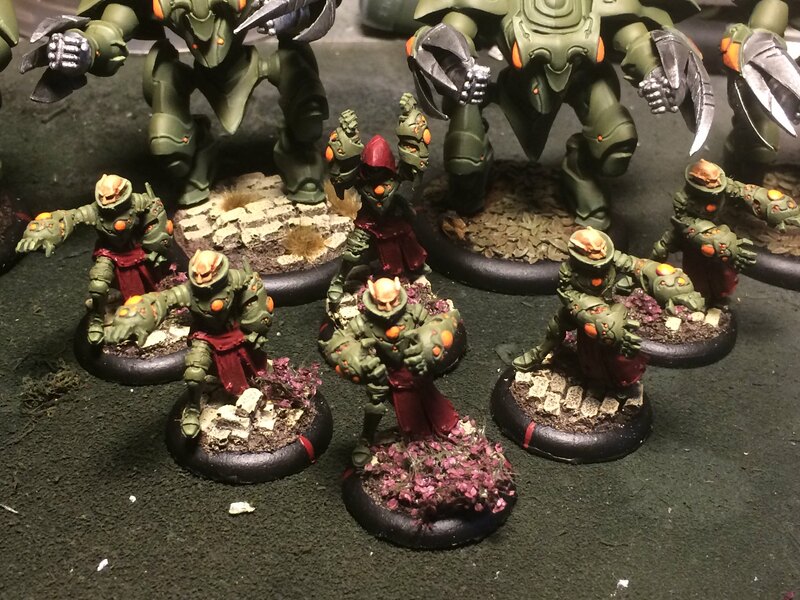 There was some speculation on Sphynx spam and I also wanted to be able to dabble in that type of lists so I wanted a bit of reserve when I came to Vyre jacks. I ended up magnetizing 4 kits. Currently 3 of those are Sphinxes and one is a Daemon. I have magnetized enough parts to make 2 Daemons and 4 Sphinxes, but I only painted up the parts for 3 Sphinxes / 1 Daemon. Because magnetizing those claws and boxing gloves isn’t exactly easy I decided I would document how I did it. 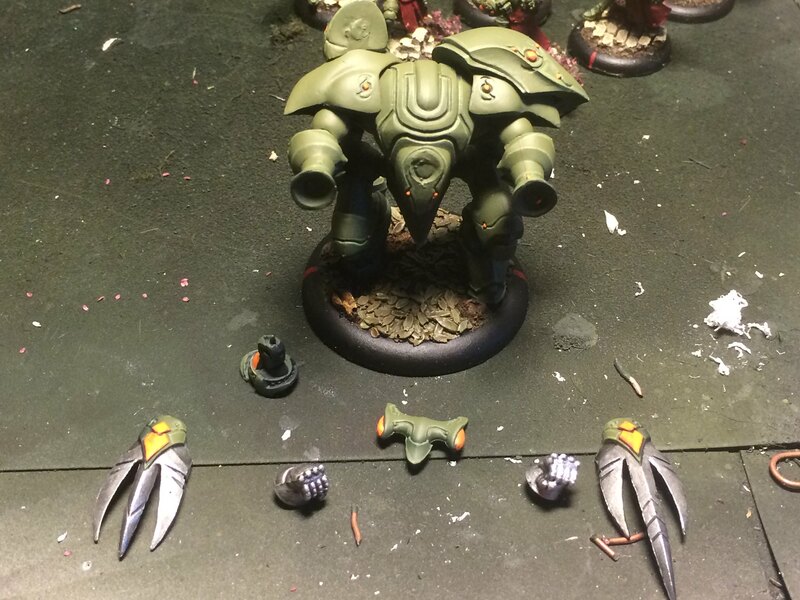 I found a post on the PP forums about magnetizing the Vyre chassis by Mastershake. He did it in a good way, however I didn’t want to use the method where the claws attached to the fists, so I had to improvise. 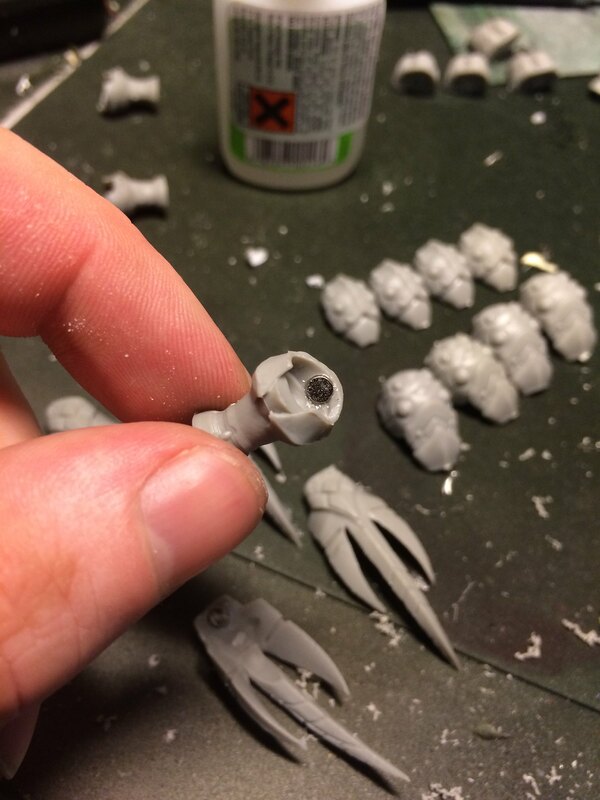 For space saving and easier magnetizing I put the claws a little more back than their normal location. I also figured picking thing up with those fists would be impossible if the claws couldn’t retract. And Wolverine has taught us all the claws are retractable for sure. I found that there was ample room inside the forearms to fit a magnet so I didn’t have to drill on the outside surface and the magnets could be hidden. This did leave me with an issue for the boxing gloves as they have to fit over the fists. Since I wanted to use as few magnets as possible I came up with the idea to repurpose some of the leftover plastic that came with the kit. There were plastic rods attached to the legs of each kit. I cut these to length and glued them in the gloves. With a magnet on the other end of the rod it would fit on the same magnets as the fists. And the rod would be covered up by the glove itself. The whole magnetizing deal did take me some time so painting was a bit slower. I also assembled Imperatus and stripped the paint from my unit of battlemages. With those models prepped and the 4 kits I was ready to start painting again. Imperatus was left behind after the airbrushing stage, I’ll finish him in the next batch. The last batch contains a slight spoiler as to which caster I’m currently playing 😀 . So now Imperatus is left on the painting table and I’m going to start on a unit of Invictors. 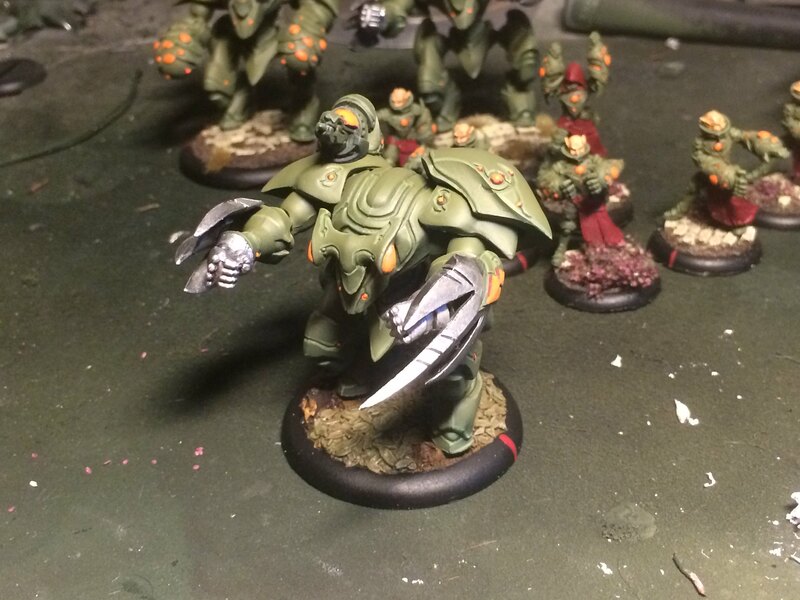 This entry was posted in Painting, Retribution, Warmachine by Tolteks. Bookmark the permalink.